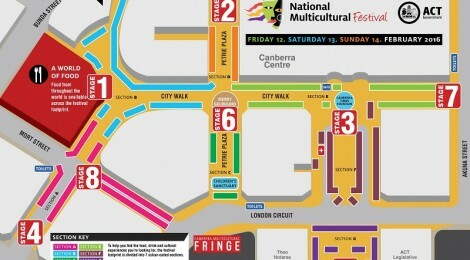 A kaleidoscope of colours, sounds, sights, flavours and fun is set to transform Canberra when the 2016 National Multicultural Festival unfolds in the city centre next February. Planning has now begun for the iconic event which unites the community in a celebration and sharing of culturally diverse traditions, dance, food, performances, exhibitions, concerts and information. Over the coming months, exciting announcements will be made about next year’s line-up in traditional and social media sources, as well as here on our website. Of course, the festival will feature all the key events and performances it’s renowned for, including: the Food and Dance Spectacular, Greek Glendi, Carnival in the City, Chinese New Year and Pacific Island Showcase. During the 2015 festival more than 270,000 people flocked to the heart of the city to revel in Canberra’s love affair with its cultural diversity. We embrace the fact that our city is one that is built on a firm foundation of multiculturalism. In fact, it’s what defines us. Canberra is Australia’s seat of democracy. We are home to more than 100 embassies and high commissions. We are a community comprised of individuals who hail from over 170 countries from across the globe. This dynamic cultural diversity was reflected in the success of this year’s National Multicultural Festival which was officially hailed as the biggest and best in the event’s 19-year history with record crowds vicariously eating, dancing, enjoying, connecting and learning at the three day extravaganza. In the lead up to the 2016 event, the festival team will be working with the many thousands of stallholders, performers, community organisation members, diplomatic corps and tireless volunteers to bring you an unforgettable experience. Let the countdown to the party begin!